This is the second of my Canadian farm vacation paintings. This was done plein air, which I always find a struggle. It's always too hot or too windy or too buggy or too "something" for me. LOL. 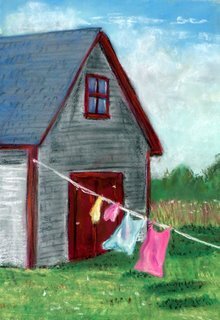 But this was just a nice sunny day with a mild breeze blowing - perfect for whipping the clothes dry and wrinkle-free, and with that marvelous fresh-air scent I love.